An awesome adventure story told as a tale (or legend) by Kevin Spacey. Since he practically narrated the film "Iron Will" (about Alaskan dogsled racing) and combined with his recent celebrity, Spacey seems the obvious choice. However, this is not some of his best voice work. The Story: 1914, already a hero in England, adventurer Sir Ernest Shackleton sets out to be the first man to cross Antarctica on foot (or at least 2/3's of it as shown by the map graphics). "Men wanted for dangerous journey: low wages, cold, safe return doubtful." Shackleton recruited 27 enthusiastic seamen and explorers, built a ship and set sail to the bottom of the world. Suffice to say, due to insurmountable obstacle after insurmountable obstacle, they never achieved their goal. But the true amazement of it all is that well over a year later, every single man returned. This IMAX film is the recreation of the storms, ice drifts, hunger and ultimately undying determination that lead to this myth-like accomplishment. 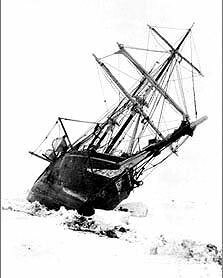 Much of the cinematography is very good, occasionally breathtaking, peppered with wonderful sepia still (and motion) images from Shackleton's onboard photographer Frank Hurley. Interjected almost awkwardly, a short act in which two modern day climbers walk the same 30-mile crevice-laden stretch Shackleton had to traverse without state of the art equipment. Extremely compelling story. At my particular screening, an audience of large format filmmakers, cinematographers, producers, and exhibitors gave it a long applause. Shackleton's Antarctic Adventure. Copyright © 2001. Produced by Susanne Simpson, Scott Swofford, George Butler at White Mountain Films/Nova/WBGH.